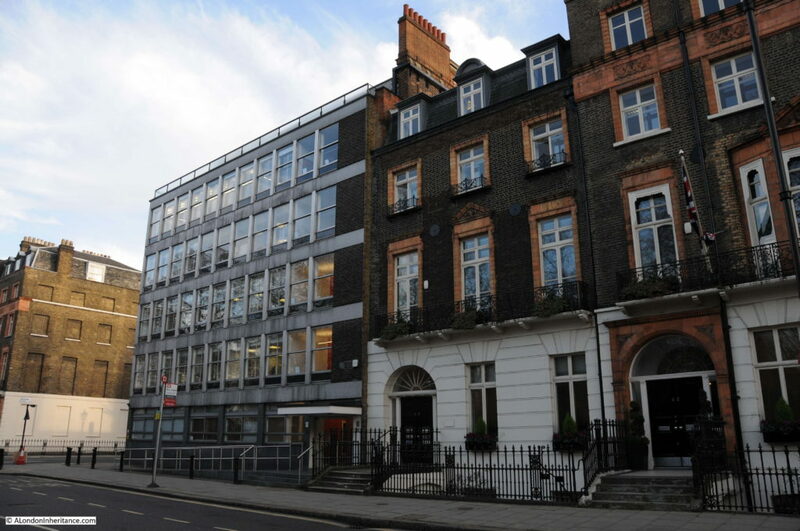 The location is easy to find and is on the corner of Russell Square and Guildford Street. A new building is on the site and rather than the Librairie Internationale, the site is now occupied by a Pret. The buildings on the left in Guildford Street remain unchanged. 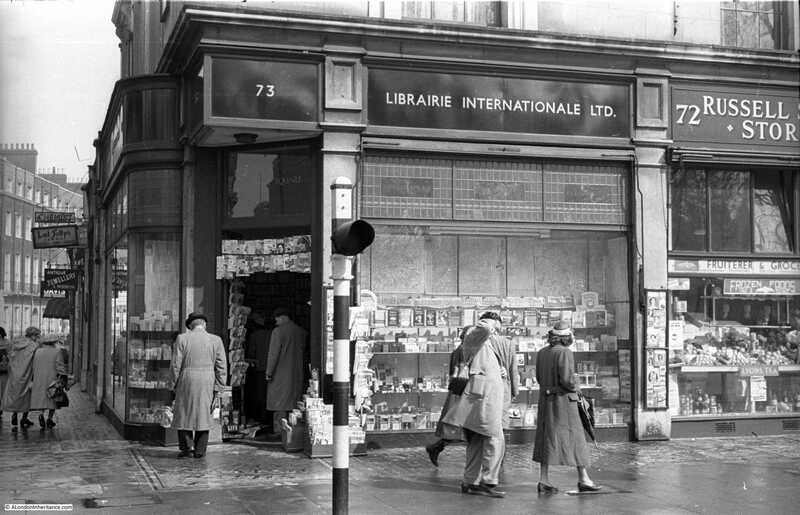 It has been a challenge to find out more about the Librairie Internationale and any information would be greatly appreciated. From what references I can find, the Librairie Internationale appears to have been somewhat of a Communist / Anarchist bookshop perhaps associated with the anarchist bookshops of the same name in France in the 19th Century (again, this is very sketchy information, so any corrections or further information would be appreciated). I have found references to the Librairie Internationale selling copies of Karl Marx publications in the 1920s and in the 1930s as one of the bookshops in London where you could purchase pamphlets such as those produced by the London Freedom Group, whose paper “Freedom – A Journal of Libertarian Thought, Work And Literature” included the address of the Librairie Internationale in Russell Square as one of the London bookshops and newsagents where Freedom could be purchased. Freedom makes interesting reading. 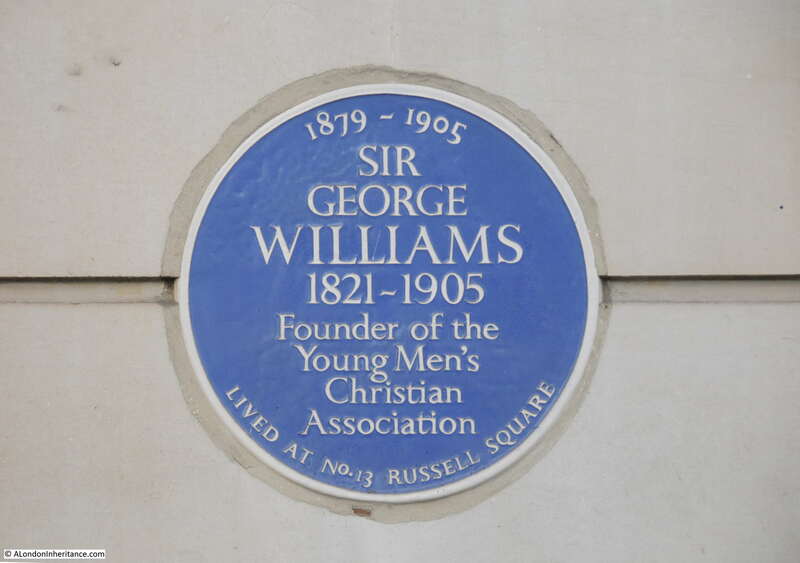 It was published by the London Freedom Group and had an editorial address at 163 Jubilee Street, Mile End. “Mrs N.F. Dryhurst’s smiling, charming face was, since the late 80’s, noticeable at all meetings of the Anarchist cause, speaking, debating, handing out bills, or going round with the collection plate; nothing was too much or too little for her to do. In ‘Freedom’ she occupied a most important position: often editing while Mrs. Wilson was away; writing up notes and comments on contemporary events; corresponding with comrades all over the country; getting them to send up reports of propaganda; putting ship-shape all their notices and reports. With her command of foreign languages she was able to render great service to ‘Freedom’ in translating and reviewing works; while her inborn Irish humour added charm to all her writing. I have ready many books and documents in researching articles for my blog and I am often struck by words that have been written many decades ago which you could also find being written today. Take the following paragraphs from an article in Freedom of January 1931, 86 years ago this month. “It has been pointed out that just as the old individualist capitalist is passing away, becoming, in the face of International Capitalism, merely a kind of rudimentary organ in a newer and world-wide industrial system, so national governments become more and more helpless to remedy unemployment. They belong to a passing era. Echoes today of the way that international concerns treat taxation and the inability of individual governments to exercise control. Probably unfair to base a view of the Librairie Internationale on the contents of one publication that could be purchased at the shop in 1931 – however I have been able to find very little information about this book shop. When my father took these photos in 1953, global politics were entering a very new era compared to the 1930s and I wonder if the Librairie Internationale was still selling the types of publication available pre-war. 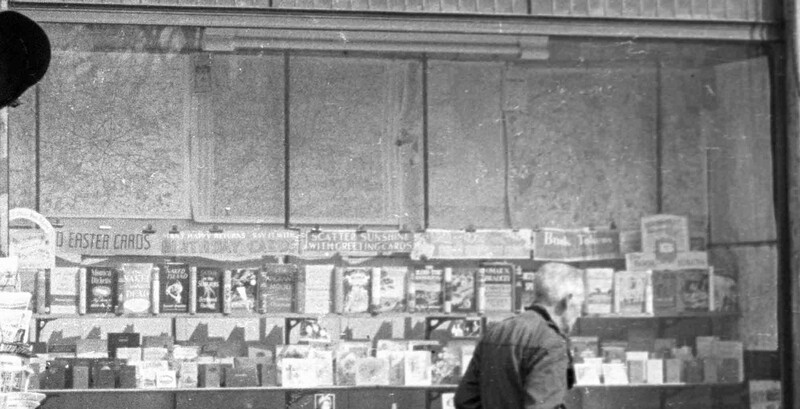 Looking at the detail in my father’s photos it looks very much like a normal bookshop / newsagent. Around the door are copies of American magazines including Life and Colliers Magazine and in the shop there are large maps on display along with signs advertising Easter Cards, Book Tokens and a sign to “Scatter Sunshine With Greeting Cards”, along with pictures of Queen Elizabeth II. In the entrance to the shop, it is just possible to make out lettering on the pavement. 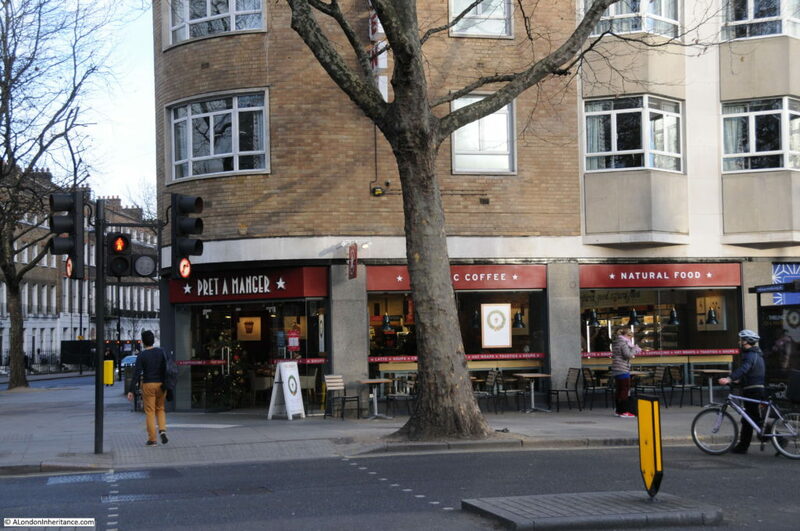 The same sign (or perhaps a later reproduction) remains to this day at the entrance to Pret. 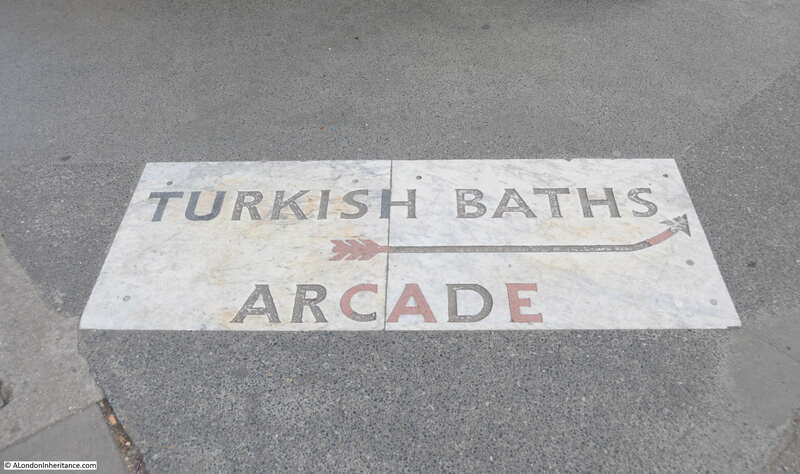 The Turkish Baths that the sign is pointing to were a short distance away from the Librairie Internationale, in the original Imperial Hotel. 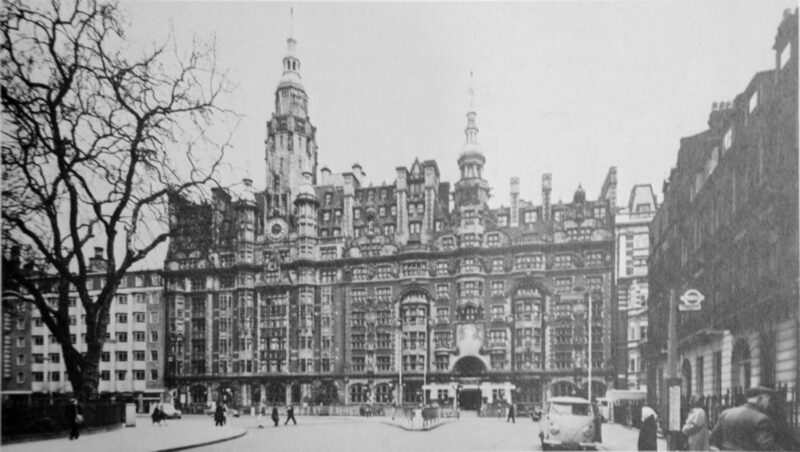 There is still an Imperial Hotel in Russell Square, although the existing building replaces the original which was demolished in 1966 and was the home of the Turkish Baths Arcade. 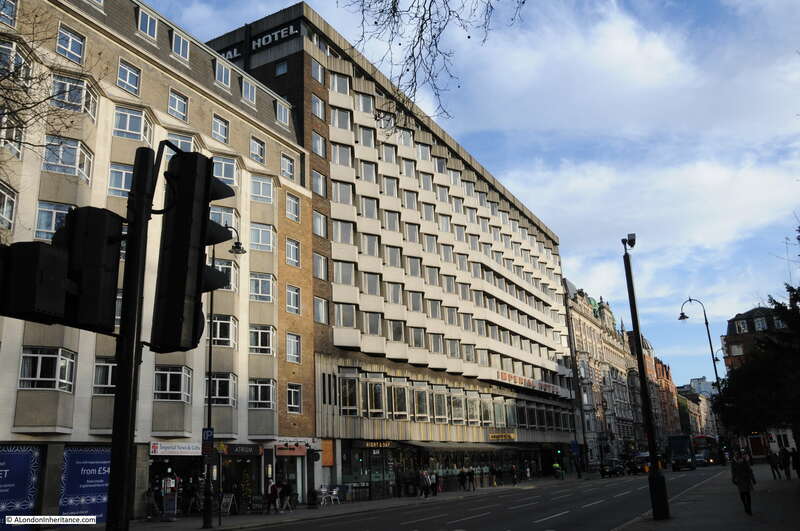 View of the current Imperial Hotel from opposite Pret. 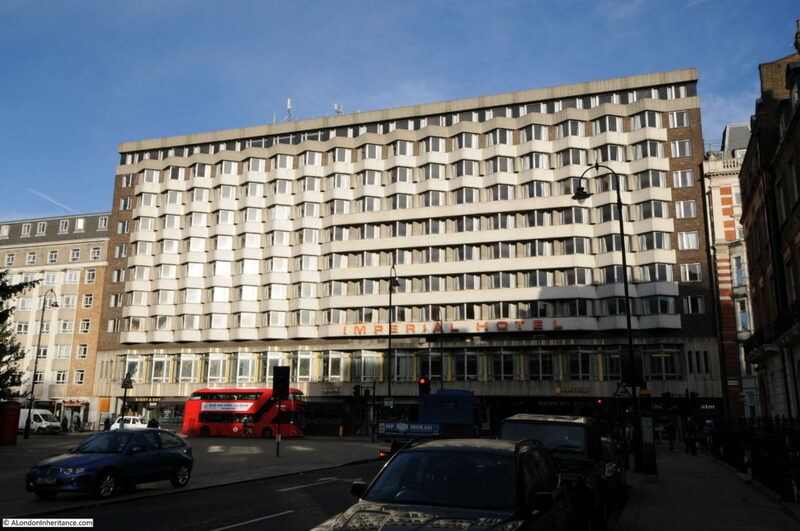 The full view of the Imperial Hotel. The Russell Hotel (now called The Principal London) is still on Russell Square but when I visited the Square the majority of the building was covered in scaffolding and plastic sheeting so very little of the building was visible. Having found the location of the Librairie Internationale I took a walk around Russell Square in the gradually fading light of a sunny December afternoon. 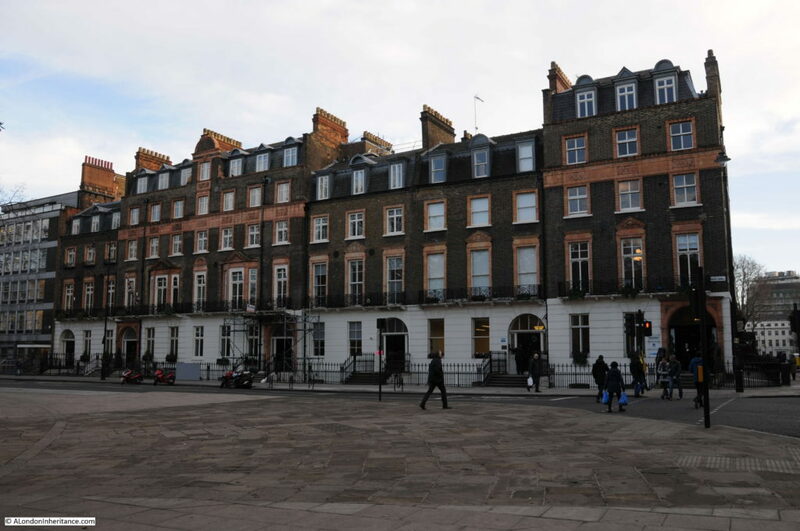 The Square, and Bloomsbury in general, needs a far more detailed description of this fascinating area, however here is an introduction. 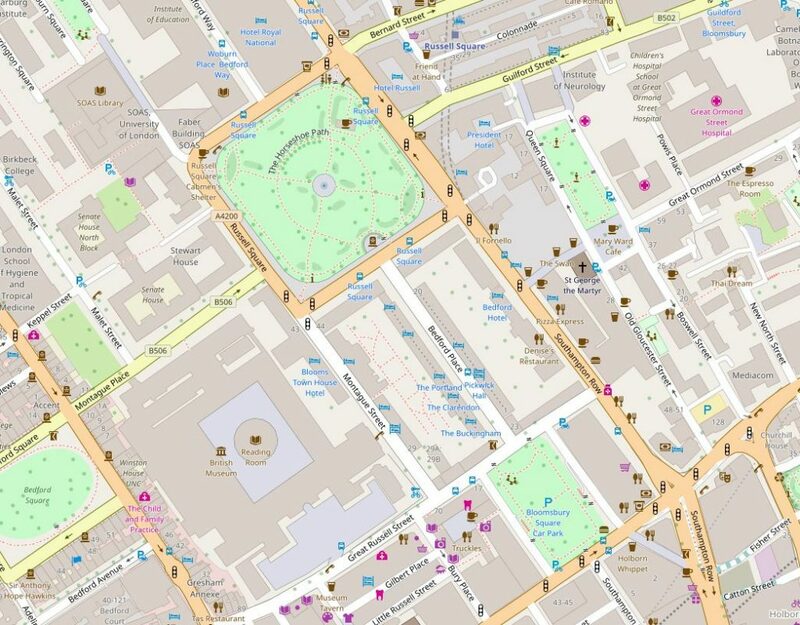 Russell Square is the large square in the upper section of the map below, and Bloomsbury Square is in the lower right. 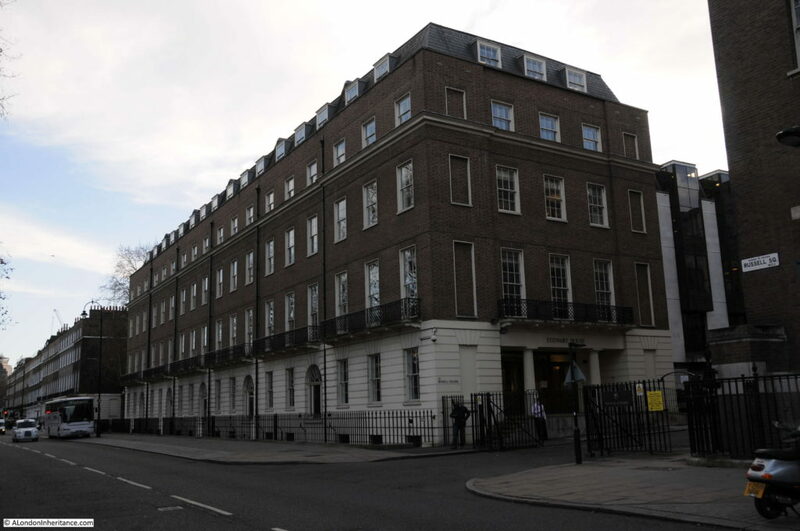 Originally Bedford House looked onto Bloomsbury Square and the house and gardens covered the area now occupied by the land in between Russell and Bloomsbury Square and part of Russell Square. 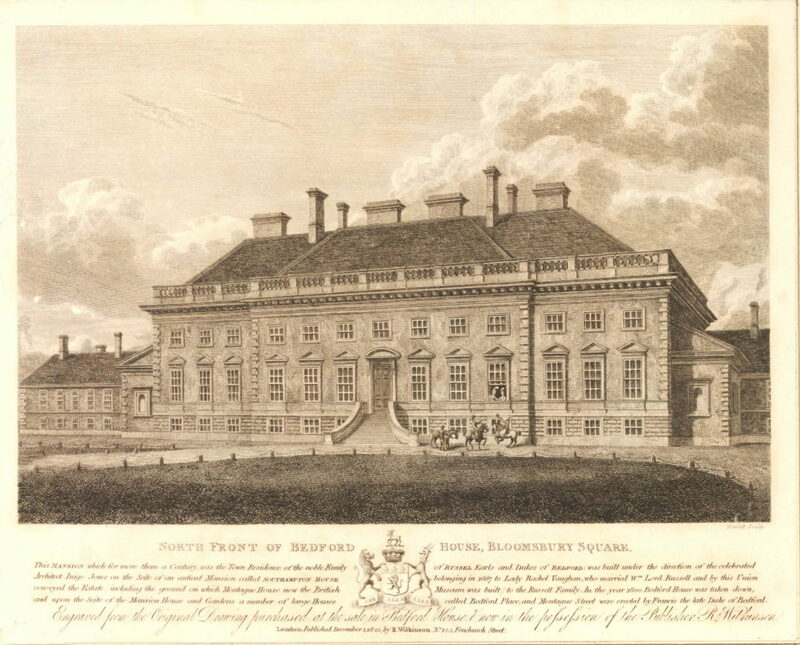 Bedford House was the London home of the Dukes of Bedford and in 1800, the 5th Duke, Sir Francis Russell ordered the demolition of Bedord House and arranged for the land of northern Bloomsbury to be developed with the architect James Burton responsible for much of the design. 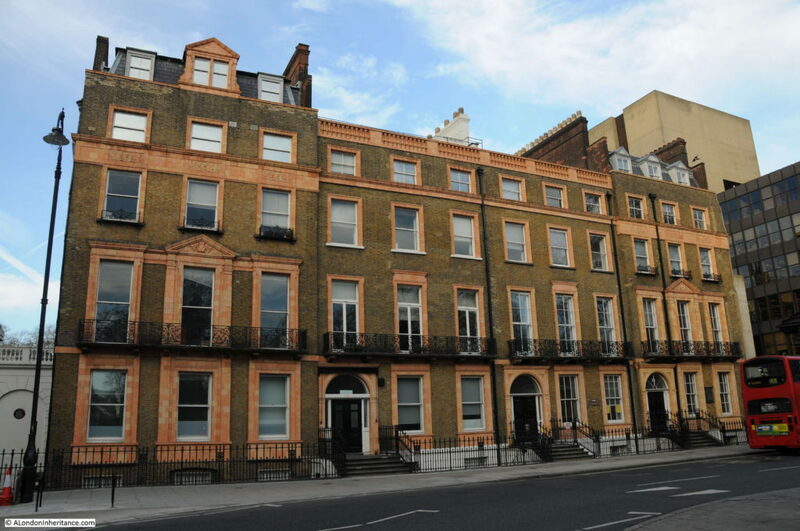 Russell Square was the centre piece of this development and the garden was designed by the landscape gardener Humphrey Repton. 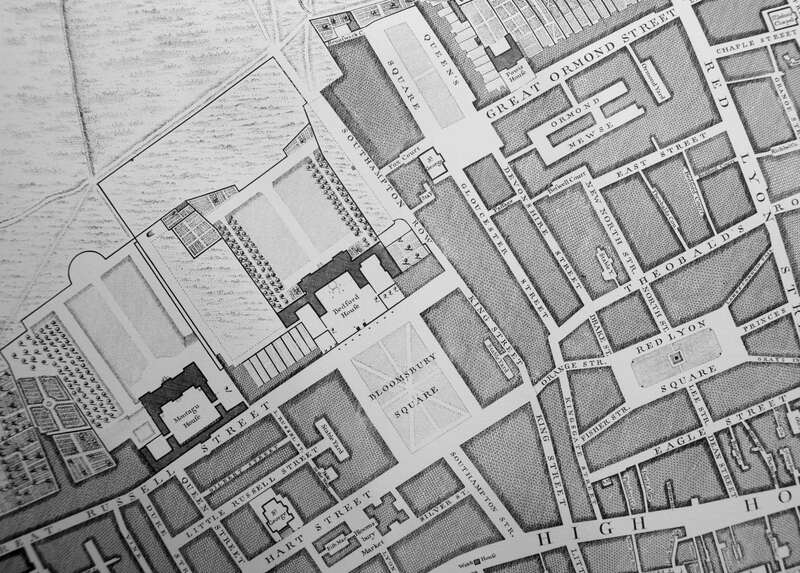 John Rocque’s map of 1746 shows Bedford House and gardens north of Bloomsbury Square. 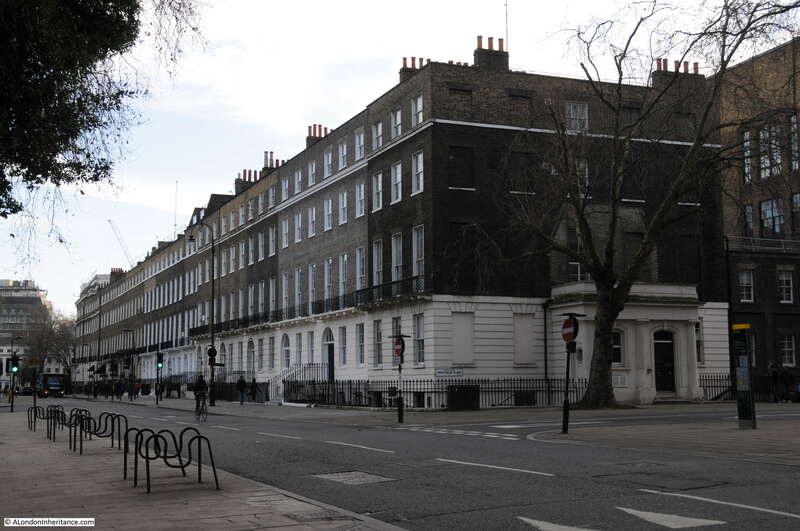 The exact location of Russell Square can be identified by comparing with the location of Bloomsbury Square and, on the right, Queen’s Square. 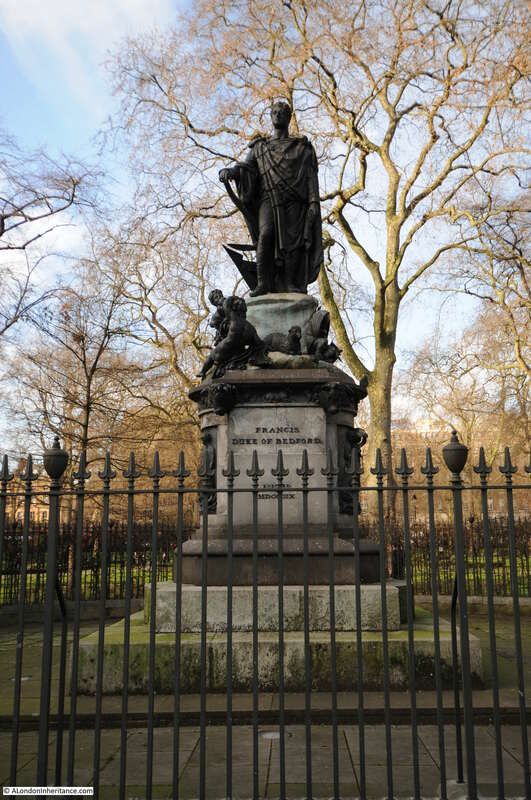 Walking up Bedford Place from Bloomsbury Square (which takes you through where the house and gardens once stood) you arrive at Russell Square with the statue of Francis Russell, 5th Duke of Bedford, standing at the edge of the gardens looking down to where his house once stood. 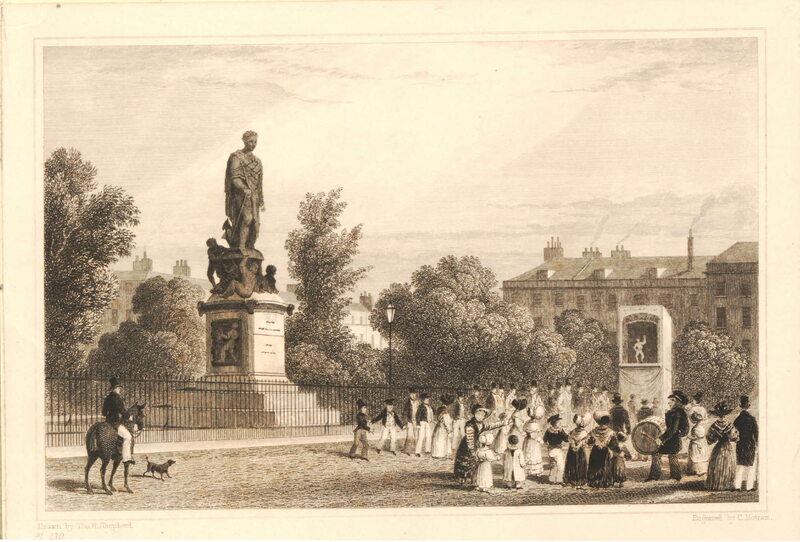 The following print (©Trustees of the British Museum) from 1830 shows the statue of the Duke of Bedford in Russell Square with a group of people gathered to watch a puppet show on the road in front of the statue. The gardens were restored in 2002 to Repton’s original design. Russell Square House on the northern side of the square. This building is on the site of a terrace of houses in one of which lived Sir George Williams, founder for the YMCA which is now recorded by a blue plaque on the front of the building. Terrace of buildings on the northwest corner of Russell Square. I like the symmetry of the terrace above the ground floor (with the exception of one window on the roof). Not sure why this symmetry did not extend to the ground floor. On the far right of the above terrace there is the plaque shown in the photo below commemorating Sir Samuel Romilly as a one time resident. 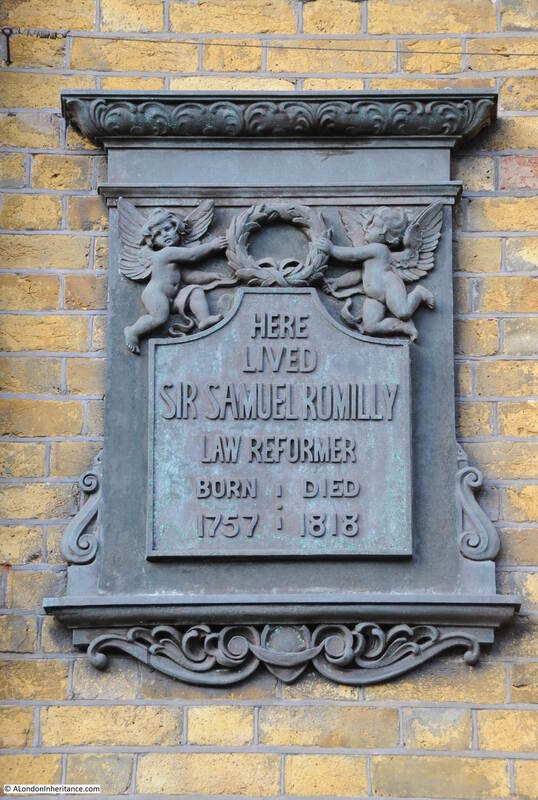 Romilly had a distinguished career in the legal profession and was also the MP for Queensborough, but was mainly known for his reforming work by abolishing many of the penalties which were still considered a capital offence. On the north-western side of the square is a run of relatively modern buildings in a neo-Georgian style. These are on the site of a terrace of Georgian buildings built soon after 1800 and designed by James Burton. The new buildings were built in this style after so much of Georgian Bloomsbury had been destroyed by the University of London. 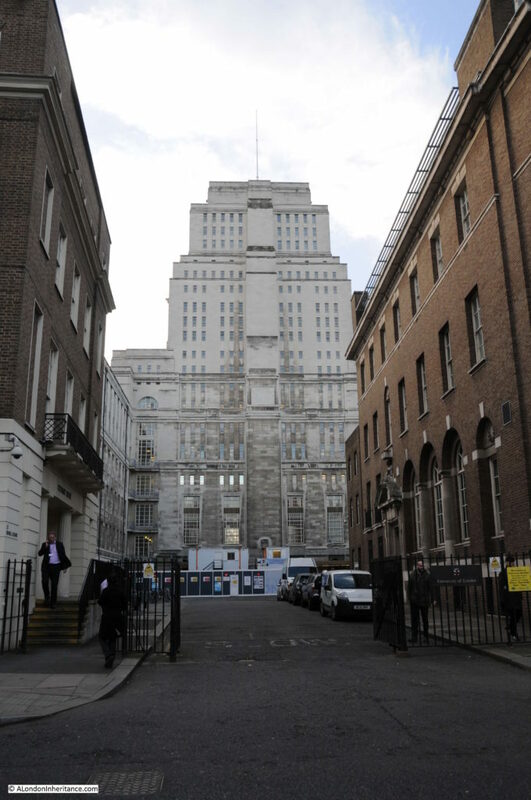 The Senate House building of London University seen between a gap in the buildings along the western edge of Russell Square. 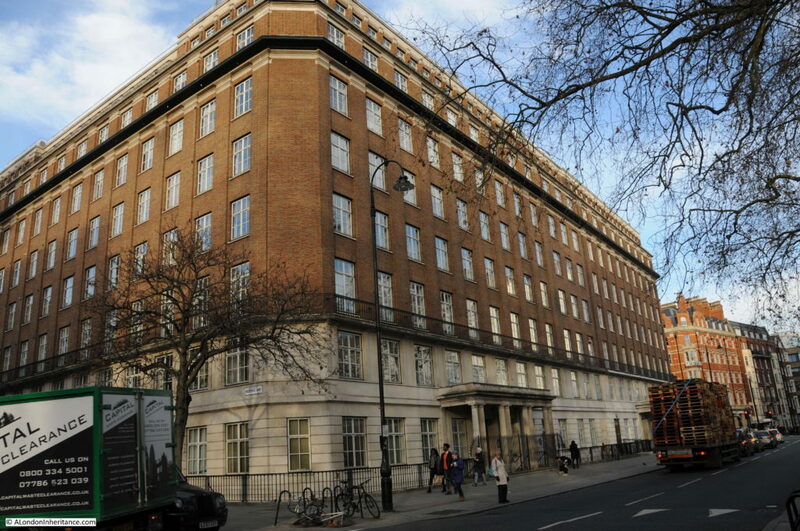 At the corner of Bedford Place with Russell Square is this relatively modern building. 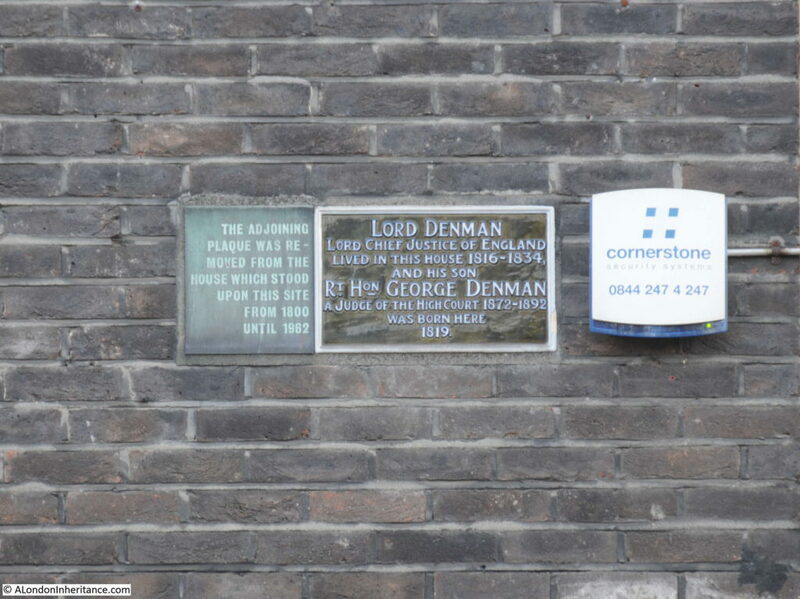 Above the entrance to this building is a plaque which was on the original house on the site from the time of the development of Russell Square, recording that Lord Denman, the Lord Chief Justice of England lived in the original house on the site between 1816 and 1834. The plaque on the left records that the original house had stood on the site from 1800 to 1962. 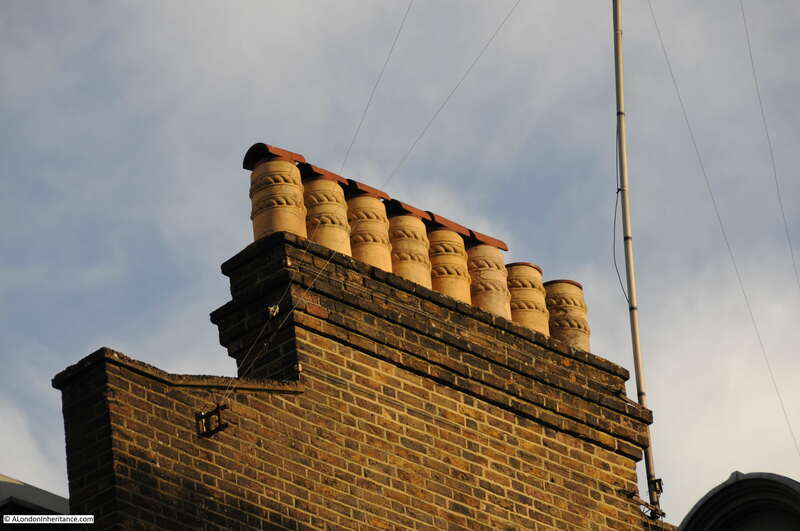 By the time I had walked around the square, the sun was getting very low and casting the whole of the square into a late winters afternoon shadow, however the sun was now picking out details at roof level which included a number of superb chimney pots including the ones in the following photo. 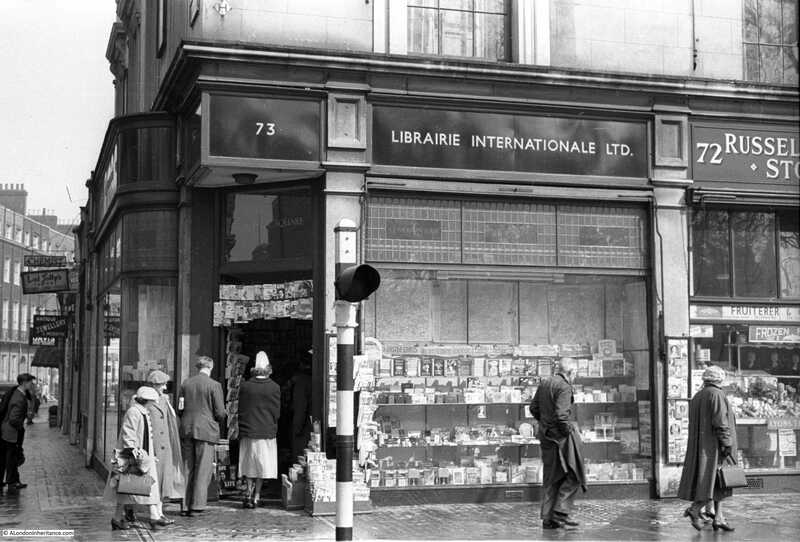 I am pleased I have found the location of the Librairie Internationale, although I am still unsure of the history of the shop and I have been unable to find any reference to when it opened or closed. 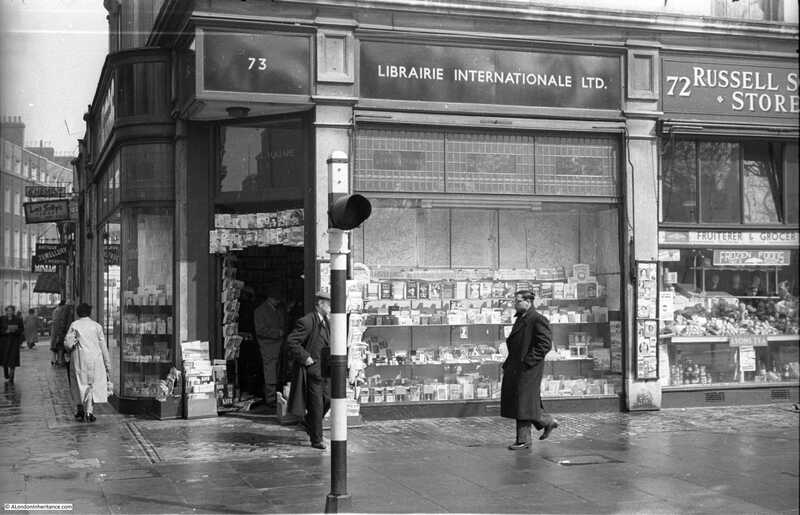 Any information on the Librairie Internationale would be really appreciated. 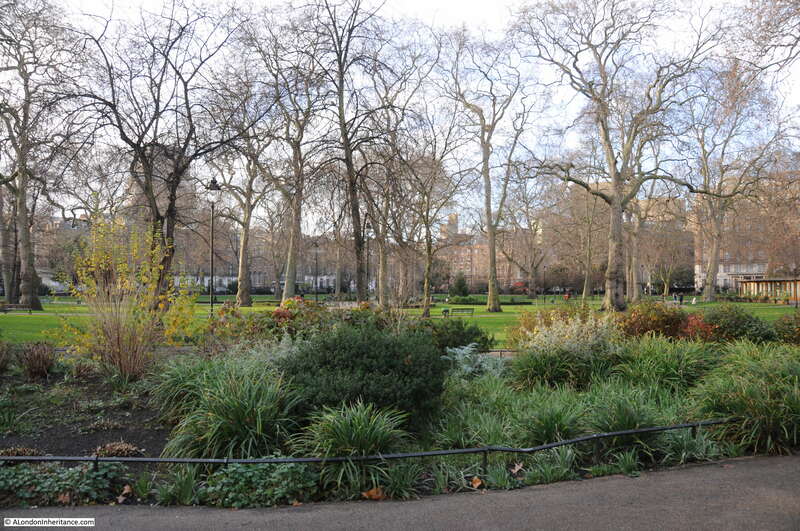 It was fascinating researching Russell Square as it illustrates the problem I have with writing a weekly post. One photo opened up anarchist organisations in London, the development of Bloomsbury and landscape gardening, a rather interesting mix in just one of London’s many squares. This entry was posted in London Parks and Gardens and tagged Bedford House, Bloomsbury, Librairie Internationale, Russell Square on January 8, 2017 by admin.